One of the easiest ways to develop a sense of tradition and history in a residential college is to create “signature pages” for special events in the college. Here’s how you can do it. The simplest method of all is to take a copy of the poster or flyer announcing a given event, and have all the attendees sign their names to it. That’s how I created the simple souvenir of an anniversary lecture in Dudley House, one of the Harvard University residential colleges, that is shown here. Signature page for a talk about life in Dudley House during the 1960s, by a former master of the House. An even better method is to establish a tradition of signature pages for a few special events that take place each year. For each such event, find a member of your college who likes to draw, get a pad of acid-free art paper and archival pens, colored pencils, or water colors, and invite your college artist to enrich a sheet of the paper with a design of your choice. The design should feature the name, date, and place of the event, and should prominently include the college’s coat of arms or other insignia. The most effective strategy (since you’re going to be making these for years to come and you want them to look like a coordinated group) is to have a simple design template which the artist can personalize with ornamental borders, colors, and type styles, but which retains the same core elements from year to year. Be sure to use a different artist for each page you prepare, so that over time, many people will be able to contribute their talents to the college. 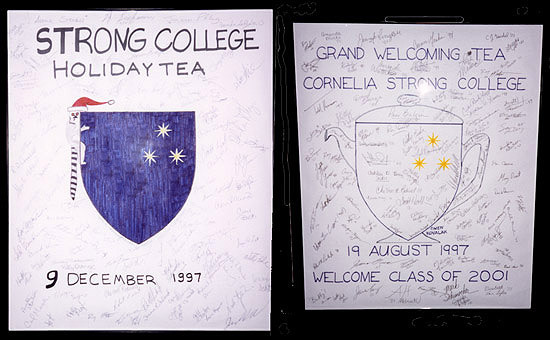 Two framed signature pages from annual Strong College events: the holiday tea in December, and the grand welcoming tea at the beginning of the academic year. Each was drawn by a different student artist from the same general template, but in each case the artist exercised creativity in the details. On the left, the college’s mascot (in a Santa Claus hat) is hanging from the shield, and on the right, the shield is transformed into a teapot. These are both relatively large items, about 18 × 22 inches in their frames. Since signature pages of this kind are meant to last forever—and if they don’t, they can’t perform their function of nurturing institutional memory—it is important always to use archival materials, and to be sure to carefully preserve each finished page. Even though you will run up against the famous Roman dictum, “Vita brevis, ars longa” (“Art is cheap, but framing is expensive”), nevertheless you should be sure to spend a little extra money to insure that only archival materials are used by the framer, and very importantly that UV-filtering glass is used. Both natural and artificial light damage artwork and fade colors, and UV-filtering glass will significantly minimize such damage over the long term. 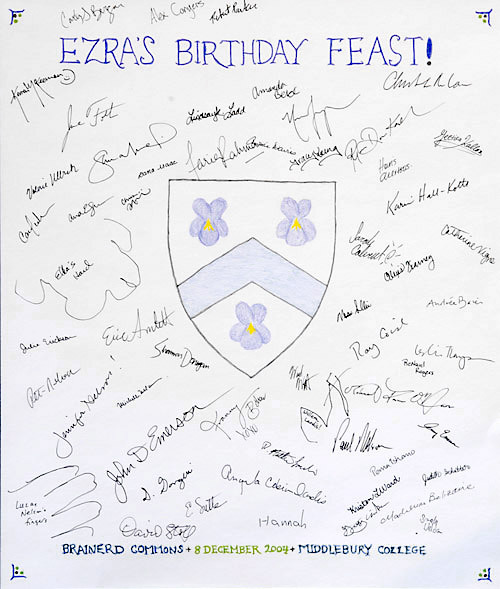 Signature page for the annual birthday feast in honor of Ezra Brainerd, namesake of Brainerd Commons, one of the five residential colleges at Middlebury. The hand and mitten outlines of two children appear along with the adult signatures. Notice also the use of ornamental corner devices that discourage people from signing too close to the edge: a little space is needed there so the matte can grab the page when it is framed. If you use a signature page to mark a special one-time event, you can also incorporate realia from the event into the framed product. A simple example of this is to include part of a ribbon from a ribbon cutting ceremony, as shown in the framed piece below. This signature page was prepared as a souvenir of my visit to the colleges of the University of Durham, and one of the events I took part in during that visit was the ceremonial opening of the Grey College Middle Common Room. After the ceremonial ribbon was cut and the crowd came in and began to socialize, the remaining ribbon was sectioned into small pieces that were distributed to everyone in attendance. I included my piece in the corner of the signature page, as seen below. 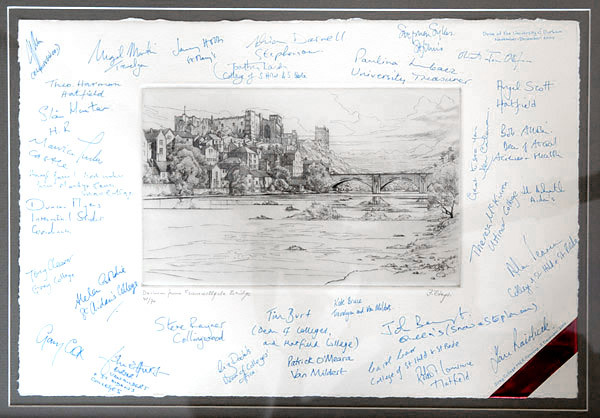 A signature page prepared as a souvenir of my visit to the University of Durham’s residential colleges, signed by the vice chancellor of the university and many of the colleges’ officers. The engraving—depicting Durham Castle—was purchased in a local art shop, and was chosen specifically because it had a wide selvage, suitable for signing. 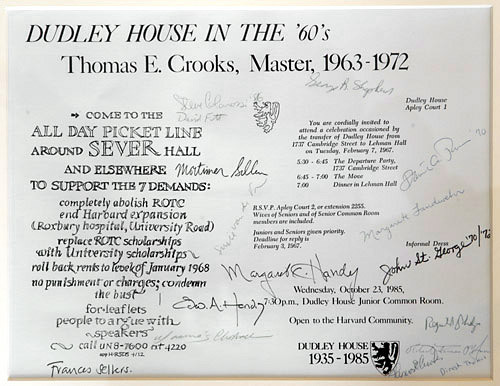 A piece of the ribbon from the ribbon-cutting ceremony that opened the Grey College Middle Common Room is shown wrapped over one corner of the page. This is another simple collegiate tradition to follow: whenever you have an opening ceremony, be sure to have a ribbon cutting, and after the ceremony be sure to distribute cuttings from the ribbon to everyone who attended.